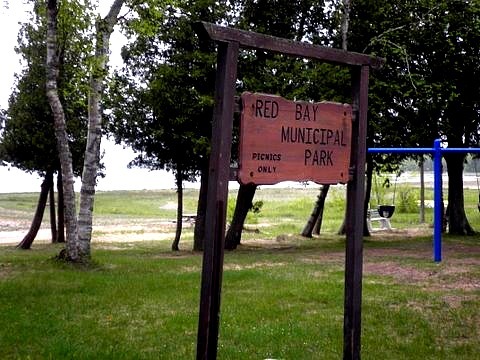 When travelling up the coast of Lake Huron, Red Bay Ontario is just above Oliphant. The Fishing Islands stretch from Oliphant to Howdenvale and this cottage area is part of that coast line. This is a great spot for the true nature lover. There are rare ferns and orchids in the two parks. One park is at Reid Point, west of Red Bay Beach and also at Petrel Point. Much like Oliphant the area is great not only for swimming (sand bottom) but also wind activities like wind surfing and kite boarding. Plus sailing or boating is more interesting in this area because of the Fishing Islands. to Red Bay, Howdenvale and Pike Bay as they are all along the Lake Huron side of the Bruce Peninsula. and I am sure there are still people doing that. For those into cycling the Bruce Peninsula Mountain Bike Adventure Park (also known as the Albemarle Tract) is close by off Bruce Road 9.
they travelled up the coast to Tobermory and the North Channel. They would note the beautiful sunsets, fresh air and startlit skies. 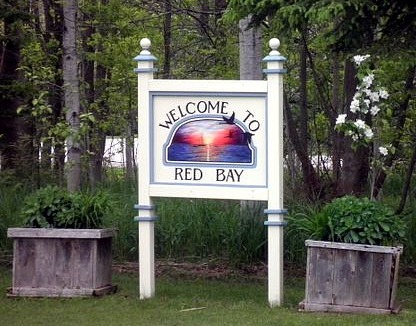 If you are looking to stay in the area there are options from the Red Bay Tent & Trailer park to bed and breakfasts and private cottages. There is even a more resort style vacation available here with lodges like Evergreen Resort and the Red Bay Lodge. Return HOME from Red Bay Ontario.